1. Hydraulic tappets are used to eliminate or reduce the need for valve clearance adjustment. An engine without hydraulic tappets must have a gap between the tappet and valve or tappet and camshaft to allow for the change in clearance as the engine components heat up. If this clearance is too small the valve may hang open and the engine will lose compression. If the clearance is too large the engine can lose power. In both cases the valve train can take a beating if the clearance is out of specification. This clearance must be checked and adjusted over time to compensate for component wear. The hydraulic tappets allow for zero or minimal valve clearance by firming up only when pressed by the camshaft. 2. The hydraulic tappet allows for a small amount of compression to maintain the correct valve clearance at all temperatures. The tappet has a reservoir oil chamber and high pressure oil chamber separated by a check valve ball and spring. When the lobe of the camshaft isn’t applying pressure to the tappet (the camshaft is on its base circle) oil can flow between the two chambers and exit the reservoir chamber to allow the tappet to compress against its check valve spring if needed. The cam lobe applies pressure to the tappet when it is time for the valve to be opened. This forces the check valve closed and seals the high pressure oil chamber making the tappet rigid so it can transfer the motion of the camshaft to the valve. The check valve opens and the tappet becomes pliant again when the valve closes and the the tappet returns to its resting position. 3. While hydraulic tappets exist to reduce the time and cost of engine maintenance, they do have their own service needs. Engines with hydraulic tappets have additional small oil passages for the tappets. If the oil passages are clogged or restricted the tappets will cease to function correctly. Improper oil viscosity could also cause problems. 4. The tappets themselves may wear over time. 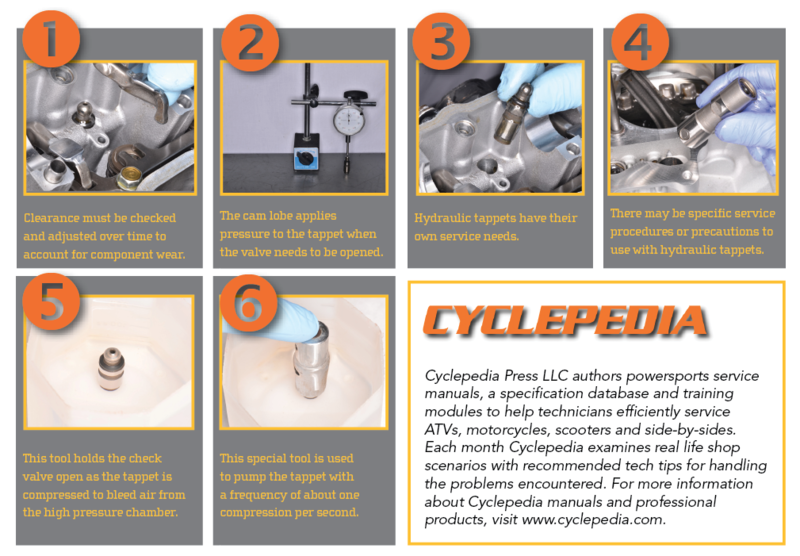 Check the service manual for any specific instructions for inspecting the tappets. 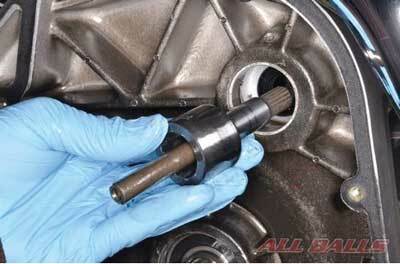 Polaris recommends against using used tappets with a new camshaft if the tappets have visible wear. In some cases there are specifications for the outside diameter of the tappets, inside diameter of tappet bores, tappet to bore clearance, and tappet compression.There may be specific service procedures or precautions to use with hydraulic tappets. For some engines it is important to keep them organized so they can be returned to their original positions. In many cases the tappets should be stored vertically as they sit in the engine to prevent oil leakage- sometimes they should be stored submerged in oil. 5. Many hydraulic tappets need to be air bled before installation. If the tappet has air in the high pressure chamber it will allow too much compression and the camshaft won’t be able to activate the valve correctly and components may be damaged. Honda requires placing the tappet in a container of kerosene and using a special tappet bleeder tool that inserts into and over the tappet. The tool holds the check valve open as the tappet is compressed to bleed air from the high pressure chamber. 6. The special tool is used to pump the tappet with a frequency of about one compression per second. Pump until air bubbles stop coming out. Remove the tool, fill the tappet bore with fresh engine oil and install the tappet into its bore.Some hydraulic tappets can self bleed with the oil pressure of a running engine. On these types the valve train may be noisy at start up, but quiet down as the oil pressure pushes out the air and the valve clearance is reduced. Stop the engine and inspect the tappets if the valve train doesn’t quiet down after several seconds of running.